A general donation will help The Christian Institute in all areas of our ongoing work, including running important campaigns, meeting the day to day costs of administration and paying staff wages. If you would like further information on leaving a legacy to The Christian Institute, then please read our guide. We are unable to accept gifts via the website of less than £2. If you would like to give a smaller amount please send a cheque payable to 'The Christian Institute' to the address below. 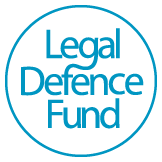 Our general fund helps support all areas of our ongoing work, including running important campaigns, meeting the day to day costs of administration and paying staff wages.